This is the fourth in a trilogy (because all the best trilogies have more than three parts) of posts on how you, as a technologist, can help address the global problem of climate change. For more background read the first post. 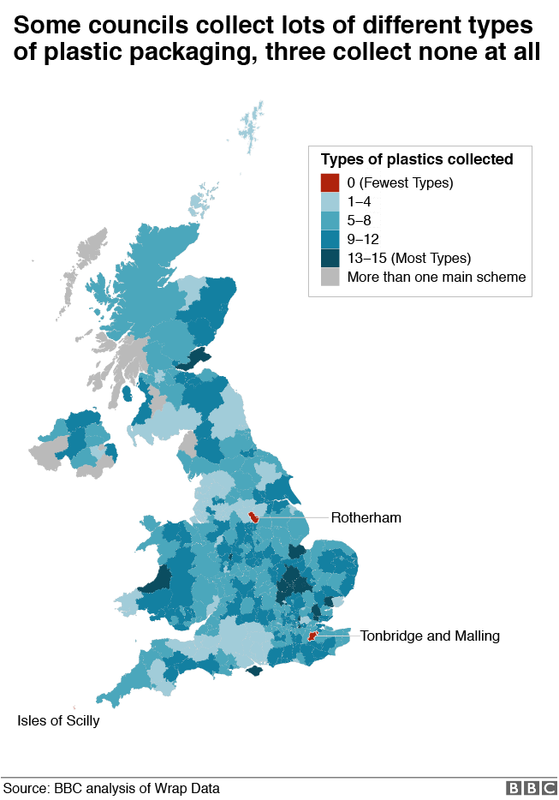 There was a recent news article about UK local council plastic recycling and it included the following map. There are currently only three local councils in the UK that don’t collect any plastic for recycling. You can kind of forgive the Scilly Isles for being so remote but Tonbridge and Malling is appalling and just as bad as Rotherham. You’re not from New York City, you’re from Rotherham. Perhaps this lyric from the Arctic Monkeys song Fake Tales Of San Francisco refers to the New York Bakery Company 1, who are actually from Rotherham. Like many other firms they package their product in plastic bags, which are difficult to recycle. Thankfully, things are changing in 2019 when TMBC will start waste plastic collection (and also start charging for garden waste collection). However, the main issue is the inconsistency between areas and we’ve got pretty far to go. There are local elections next year and there is a good chance that the Green Party will get a local councillor, which should help improve the environmental agenda. Tonbridge is a bit odd in that it doesn’t have a town council, so the district councillors have a lot of influence. You can see what is collected in your area by visiting the Recycle Now website. However, the BBC article claims there is still confusion at home about what is recycled, so there are additional opportunities here to provide technological help with access to recycling information. Perhaps an app that scans barcodes to tell the user how to dispose of packaging would be useful. One non-technical improvement would be to mandate nationally consistent recycling collections but even better would be to add deposits to packaging so they get returned to the shop (as is the case in many European countries). This may also encourage people to be better behaved and drop less litter. We’ll have to wait and see what the results of the government review are. The focus on plastic waste is pretty trendy right now, so much so that you may get a paper straw in your disposable plastic cup (to drink your deliciously dry-hopped irony with). For all the plastic cup politics, if it leads to an improved outcome then it doesn’t really matter. The same could be said for the recent rise of vegetarian options, but if you dig on vegan food and find the beef steak is now the cheaper dish then the economics may have gone a bit wrong. Recycling of any material is positive if it reduces the resources and energy used in manufacture. However, reusing rather than reprocessing is even better and best of all would be to not create waste in the first place. By making more information digital we can cut down on waste. For example, there should be no need for physical newspapers in the future, particularly the excessive free papers that run on an advertising model. Digital news takes up less space and creates less waste. We can all do our part by not buying papers and not picking up the free ones that end up littering our public transport. That’s not to say that digital content does not have a carbon footprint. It does and we should all do our part to reduce it by choosing to power infrastructure with renewable energy. This has been covered earlier in this series and before. Remember, as technologists we can help by using hosting providers that only use 100% renewable or carbon offset energy (for certain clouds you should pick particular regions). One area that I forgot to mention previously in regards to investment is crowd-funding. You can put your money into worthy endeavours and get a higher return than traditional sources, but with an obviously higher level of risk (so don’t invest what you can’t afford to lose). Another area where digital technology can help is in modelling and calculation. Build tools to help people make the best decisions by plugging in their specific numbers. These could even be just spreadsheets shared online. For example, is it better to install hand-driers or paper towels in a communal bathroom? Or if there are both then which should you use? There are many factors to take into account to work out the real total cost of ownership to people and planet. A non-obvious parameter is hygiene and disease-control, for example the high rate of pathogen transmission from Dyson air-blades when used in realistic environments. For some ideas of calculations that could be digitised and made interactive you may want to read How Bad Are Bananas? by Mike Berners-Lee. Some big beneficiaries of these simulations could be small (organic) farms. A lot of agricultural technology targets large-scale farming operations and this also includes mechanical automation. If these tools could be scaled down and distributed then it would have a positive effect. It’s important to get domain experts involved and not create solutions for problems that don’t exist. However, if you’re willing to engage with under-served yet important sectors then there are plenty of relatively achievable challenges to tackle. Feel free to get in touch. I’m always open to new ideas and will also happily provide feedback on yours.